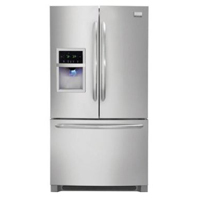 External vs. Internal Water and Ice Dispensers in Refrigerators; Which is better? If you have kids you know this can be an important issue. Kids like to play with water and ice dispensers and don’t think they cant figure out the safety lock ( I know I have two boys). For this reason we purposely avoided a water and ice dispenser. But there are more reasons to really look into this feature. Obviously, the easy answer is just to get the internal water and ice dispenser if you want to avoid lots of clean ups from kids. Filter changes should cost about the same for either style. One consideration is appearance. Most people like the clean look of not having the dispenser on the outside of the refrigerator. Understandable say I. Agreed. But then there is a major reason the external water and ice unit may be better – energy savings. Opening and closing the fridge every time you want a glass of water can add up over time by making the refrigerator work hard to bring the fridge back to the correct temp. This cold also impact how well your food is refrigerated. Refrigerators are notorious energy hogs, so this is a major reason to debate whether cleaner looks or energy costs are more important to you in deciding which to get. While manufacturers are constantly playing with new features why not this: A small stainless steel door which opens to the water and ice dispenser thus eliminating the two negative issues associated with them.